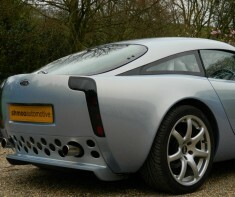 Buying a TVR is always going to be a Heart over Head experience…..or is it? I had been looking for the perfect MK1 Tuscan S for a number of months and having viewed too many cars to remember, all of which were nice but lacked the wow factor, I struck lucky with a call into Shmoo Automotive. Without any prompting, they immediately replayed the challenges I was faced with – body work was tired, bad colour schemes, heavily customised, mechanically questionable, interior looking very sad, chassis needs significant work etc etc etc. But supplemented by their confidence that great Tuscan’s did exist and I wasn’t chasing a dream. Throughout several conversations with both Ed and Ross, their knowledge and passion for cars was clear, as was their genuine willingness to help regardless of where I was buying from, this was incredibly refreshing. The car in question was a stunning and completely original one owner MK1 S in the most spectacular unmarked Ferrari Azzuro Hyperion pearl. A full engine rebuild with the Powers 5 year engine warranty was already booked and with it the opportunity at this early stage to include all of the must do things and upgrades whilst the engine was out…more of which in a moment. What else could you possibly ask for I hear you say? And the answer was nothing – except for the fact that this beautiful car was generating a lot of interest from other would be buyers and I needed to move fast, but with work and travel commitments I wasn’t going to be able to view the car quickly. However, Ed sent me plenty of videos and photos of the car, both the good and the areas that proved it wasn’t a brand new car. These included chassis and suspension videos …. So, I did what any other right minded TVR buyer would do and brought it blind without seeing it in the flesh. Whilst it sounds inconceivable, the relationship that I’d developed with Ed throughout the process gave me more confidence in buying this car than any other before it. His professionalism, passion, honesty and relentless attention to detail left me in no doubt at any stage that this car would be anything short of perfect. And I wasn’t disappointed. Some of the work I had carried out is listed here. Alloy radiator upgrade, heavy duty starter motor, upgraded and all new oil pump, re-bushed throttle pots, relined block, new clutch, front spacers and suspension set up silicone hoses etc etc…plus a few other things that took many hours of time from Ed to make the car spot on. All justified by the fact the engine was out; stripped and labour costs were being saved. I think the wife could see my man logic on this one as well…phew! The car had to have a few blemishes sorted, Ed’s want more than mine really and after many weeks of updates, with more photos and video updates from Ed, all of his advice, knowledge, the hours of preparation and focus on the small details resulted in what I (and the many people who have complemented me) think is the best Tuscan MK1 S out there. The car was delivered on the day of the Royal Wedding on May 19th 2018. Harry remembers it for his reasons; I remember it for the day my Azzuro Hyperion Princess turned up. I can without any hesitation recommend Ed and Shmoo Automotive Ltd to any potential buyer and I know this will be the first of many cars I have from them. Harrys got style – TVR is the only direction! 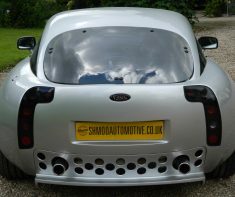 Earlier this summer I bought my first TVR from Shmoo Automotive Ltd. Within a few hours from sending an online enquiry form I had an email back with some more information, exactly the kind of prompt and helpful response I soon found to be the norm. The car I was interested in was based at the Devon address, so I was introduced to Ross who deals with the cars down there. We decided to turn the trip into a long weekend with the wife and dog in tow. Ross was incredibly accommodating. I got to try both models (T350 & Tuscan) and my wife got to be a passenger so she could provide her feedback on them as well. We then sat down over a coffee and looked over paperwork with Ross on hand to answer any questions. At no point did I feel I had to make any decisions there and then, I left and spent the journey home with a notepad and pen going over my observations. 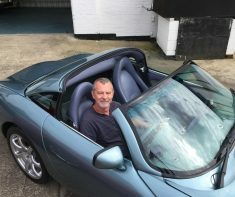 Once home I decided I wanted to take it further and get the T350 independently inspected; not a problem and Ross arranged to get it in at another local TVR specialist to give it the once over. With report in hand and excellent feedback across the board the T350 joined the family. 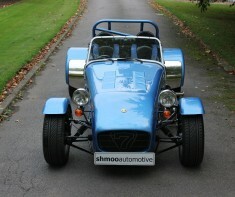 Shmoo Automotive organised delivery and at an excellent rate, with the car arriving on time. I was expecting some initial hiccups (it’s a TVR…) and I had one issue, a quick text to Ross asking for advice and I got a call back within minutes. A new part was required and without even asking for it, Ross said their warranty would cover it for me. Since then I’ve texted the odd question and Ross still takes time to be as helpful as possible. Loving the car and thanks to Shmoo Automotive for all the help and helping me join the TVR family. Shifting tectonic plates make less noise! 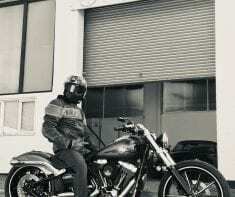 A couple of weeks and 400 miles later and I’m absolutely loving the Harley, and so is everyone else Ed! “Until recently, I would never have considered buying an item online valued at a five-digit figure. And therein lies the strength of meeting Ed at Shmoo. Not only is he responsive online, but in person, he immediately puts one at ease with his honest frankness and authentic passion for the vehicles for which he’s seeking to find new homes. 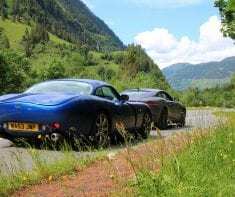 A Mini TVR adventure with Shmoo Automotive – Summer 2018. Having owned two classic TVR’s in the 80’s, a Taimar and a 280i Coupe, I recently made a decision back in the earlier part of 2018 to find, (in my opinion) one of the best looking TVR’s ever designed. I was looking for a T350C, which I think has styling that harks back to the M series TVRs. I thought that a Red Bull blue coloured car would be the one to find but having initially viewed two of those, (one of which was in Devon at the other Shmoo Automotive location) I decided that darker colours tended to kill the beautiful lines of the car and started looking for a lighter coloured example. It turned out that Shmoo also had a 2003 T350T in BMW Slate Green pearl undergoing preparation.. so a trip to Leicester was booked and I viewed the car with Ed at the body shop that was doing some paintwork and fettling to the car. I would describe the body colour as a very beautiful, almost classic Aston Martin inspired shade of green, and the interior was equally stunning being a mix of Fern Green Ambla, Nimbus Grey Ambla and Forest Lamonta all of which coordinated with the body colour to make this particular TVR stunning in every sense of the word and very classy. 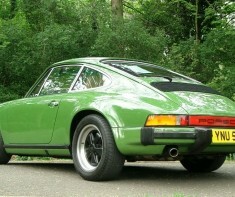 Ed had even had the door panels recovered in matching green leather, just to make it that little bit different. Having read that it is worth finding a car that has had the engine sorted, so another plus point was this TVR had been subject to a full engine rebuild at Racing Green five years ago and had covered just 4000 miles since then. Although I had not set out to find a targa this one was so attractive and drove well on a test drive that it ticked all the boxes so I could not resist striking a deal to purchase. After some further fettling at the body shop the car was transported to their Devon location in Rose Ash near South Molton where some mechanical work including a 12000 mile service was undertaken by their TVR mechanic Phil, who was too busy to make his usual trip up to Leicester to complete the work. Although Shmoo would have transported the TVR back to me in Worcestershire, a date for pick up was set to coincide with a TVR meeting being held on the village green in Rose Ash…. but how to get there? Ed kindly offered to pick me up on his way down to Devon for the event as I live a few minutes from the M5. Perfect! So, on an already hot and sunny Friday in June….my village was awoken by the roar of my approaching transport. Which was a rather stunning blue Tamora with Ed on board, and a T350C pulling up at my house, which his business colleague Ross was driving having just picked it up from Powers in Coventry following an engine rebuild to 4.5L specification. (Nice!). Busy Friday afternoon traffic around Bristol meant the journey took way longer than anticipated but the ride in an open top Tamora with the Speed Six engine on song, popping and banging as we travelled, with clear blue skies above was just awesome. Ed and I both got the sunburn to prove just how hot it was! A stop in an hotel in South Molton on the Friday night was followed by another pick up from team Shmoo on the Saturday morning for a short trip to the village green car gathering. My T350T was parked on the grass verge, on a typical English village green. The sun was already shining and you really couldn’t ask for a better way to collect your new toy. It was parked between the Red Bull blue T350C I’d been to view just a few weeks beforehand and a Redglow pearl Sagaris on the other side of it. As I’d viewed and nearly bought the blue T350C a few weeks earlier, seeing the two side by side… I knew I’d made the right decision to go with the lighter coloured targa. After meeting and chatting to other fellow TVR petrolheads and sampling homemade delicacies being sold in the village hall, I made my exit a few hours later and headed for home. What a great experience with Shmoo. They sell some lovely TVRs and have a real passion for the marque and it was the best secondhand car pick up ever! I’ve had the car 5mths now, and each drive is still an event that I very much look forward to. The story does not end there as I have had continued communications with Ed since purchase, which shows their commitment to please and stay in touch with their customers. Thanks chaps, I’m so pleased I’m back in a TVR….here’s to a few more adventures! To Dream the impossible dream…..
hours on it, and I always pick the TVR Griffith. This game will have a lot to answer for. (It’s also the date that a certain Olympic Blue TVR Chimaera 400 HC was registered.) I know that I’d love a TVR, Griffith, Chimaera, Cerbera; any will do…lets be honest!…. but I’m 16yrs old and it’s just a pipe-dream. one”. Top tip; always do as the new wife says. So the game becomes a reality…. it’s only a short hop away. So , that’s about as faraway as you can get and still be in the same country, damn! leave and that will see it right for a while to come. name or the company reputation to a half-cocked job. Don’t buy the first one you see/get excited about. still there because of the weather. Ross is worried that the car has had a new camshaft but has driven about 20 miles since because of the weather, so it’s not road-tested to the degree they’d ideally like, that’s not a good thing in a TVR is it?!! old again, I need the controller in my hands! The paperwork was all in order, no fuss, no hitches, the keys were mine. I was asked to let them know I’d got the car back home ok and to call if I got stuck…..I’m definitely 16 again. life-box, I have my TVR, and I stick my foot down. grinning whilst I write this. off for a drive now, Thanks again guys. The dream came true! Well, with my early mid life crisis in full swing and after much time spent online considering various options I decided to go full ‘petrolhead’ and buy a TVR. Having never owned or even driven anything like it I decided a Chimaera would be a good place to start and set about looking for one that was as original as possible and didn’t have one of those horrendously coloured interiors that some of them seem to have. I hit the jackpot (or so I thought) when a Starmist Green Chimaera 450 with grey leather interior popped up on Autotrader. It was perfect, so I arranged to see the private owner that weekend. Then a couple of days later he apologetically informed me that another buyer had committed to purchasing it and was on his way over to pick it up. Gutted to have missed out I went back to the search. A few days later what looked like a very similar car popped up online again and I made enquiries. It was indeed the very same car! This was when I first made contact with Ed at Shmoo Automotive Ltd, who it transpires were the buyers that had been a little quicker on the draw! It turned out that after speaking with Ed, the car needed a bit of work doing to get it to the required retail standard for Shmoo. They were very happy to collaborate with a potential buyer on a project to get it back to its best. At such an early stage, it would mean we could all make the most of the situation and a degree of custom prep could be undertaken. 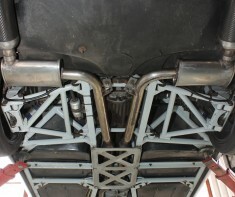 The car was due to be shipped to Devon as it was suspected that chassis work would be required, and that would be where I could view the car before their full prep list began. At first I was slightly miffed thinking that this would mean I was paying more than I would have done if I’d been quicker to buy from the previous owner, but I quickly realised I didn’t have the first clue when it came to TVRs (or cars or anything vaguely mechanical in fact!) and these guys really knew what they were talking about. They quickly built rapport and trust and I felt in very safe hands, it genuinely felt like their priority was doing the best by me and putting together a car that would be my pride and joy. I first saw the car at Ross’ beautiful place down in Devon – it could not have been more picturesque set in rolling countryside and a perfect summer’s day – ideal for my first test drive! Just another great part of my experience. We worked out a budget and discussed possible options. My main focus was more mechanical than cosmetic – it was in pretty good shape and had been well looked after but I wanted a reliable (or as reliable as possible) TVR so I could focus on enjoying the drive rather than spend all my time on the side of the road waiting for the AA! Ed and Ross guided me through the options in an impartial and objective way, making me feel like I was making informed decisions about what was needed. These included new hand made outriggers, redoing the hood, full engine overhaul including new camshaft and chains etc and fixing a pesky oil leak (it hasn’t leaked a drop in my ownership since! ), new tyres all round and fixing a few cosmetic and functional bits. Throughout the process no detail was spared and they were fantastic at communicating and being a joy to work with. They clearly have a great network of people they use and I always felt like I was getting the best service with no expense spared and updates a plenty as the work progressed. I quickly realised that actually Ed having bought the car before me was the best possible outcome I could have had. I wouldn’t have had a clue where to start with the work that needed doing and there was no way I would have had the time to be organising all the works on my own, let alone researching who would be the best people to use. I felt in safe hands all the way through which was great peace of mind, especially when everyone you know is questioning your decision to buy such what they think is an ‘unreliable death trap’. I can’t thank Ed and Ross enough, the final product has been an absolute joy and continues to be every time I turn it on and hear the beasty 4.5 V8 roar and rumble into life. I picked the car up from Devon from their valeters (Ryan at RP Detailing) who had made it look brand new inside and out (I’ve never seen such a clean engine bay!) but Ross handing over the keys wasn’t the end of the process, the guys have been incredibly supportive ever since, recommending mechanics and advising around questions I’ve had from my 1000 mile oil change and even paintwork…due to a jealous soul last summer! My initial plan was to keep the car for a couple of summers and then sell it on but I’m smitten and plan on keeping it for good, best purchasing decision I ever made and from the first phone call to driving off into the sunset, an amazing buying experience – I’m extremely grateful, thank you Ed and Ross of Shmoo Automotive Ltd. Sounds like that’s a…Czech mate? I can highly recommend Ross and Shmoo Automotive Ltd. The service was of a very high standard, friendly and professional. The car was as advertised, with no hidden surprises. The vehicle was well prepared and valeted. Aftersales support since collection is also outstanding, with a friendly and helpful approach to solving problems of all sorts. ….and that’s helpful when you live in the Czech Republic! One of the very few negatives of living north of Hadrian’s Wall is that most of the good cars are usually pretty far away. And so it came to pass with a Mk1 Tuscan that caught my eye online – at Shmoo Automotive Ltd….and not at the Leicester office, but 462 miles away at the Shmoo Devon address! 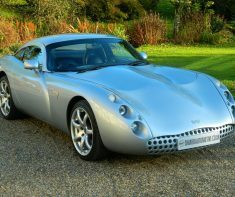 I’d heard good things about the company through the various TVR circles, so I gave them a buzz to find out more. My initial enquiry landed with Ed, and he passed me on to Ross who had the car down in the south. They couldn’t have been more helpful. So much so, that I felt confident enough to buy the car ‘blind’, and have it delivered to Scotland by a third party recommended by Shmoo. The car arrived as scheduled and it was exactly as described. Sadly, I’ve since had to sell her due to ill health, but I hope to be back in the market for another TVR as soon as I am able. (We hope you are to Scott – Ross & Ed). Triple ‘A’ Score from the sale of a FFF Tamora. After a posting with the Foreign Office and the EU lasting three years I was wistful for all things British and my imminent return to the UK and the Ministry of Justice meant that I had to buy ‘sensible’ transport in the shape the now almost ubiquitous SUV but, more pleasantly, it also afforded me the opportunity to indulge myself somewhat. Now indulgence can take many forms. For some people it’s a quality Swiss watch or two, for some its foreign travel or a full wine cellar. For me, indulgence has always been connected with shooting and with cars and bikes. I have owned all sorts of cars and bikes over the years and yet in the back of my mind I always hankered after a very British TVRS3 that I didn’t buy all the way back in 1993. At the time I took what I thought was the sensible decision and I bought a Porsche. The guards red and linen leather Porsche was a fine tool for the job that it was intended for. It was moderately quick. It was efficient. It was ergonomic. But it was also Teutonic, sterile and soulless. 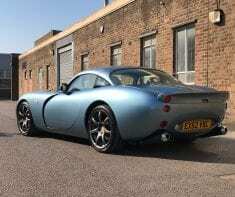 I always missed the opportunity to buy that S3 and so In the summer of 2017 and anticipating my return to Blighty, I decided to right a longstanding wrong and to buy a TVR. After some deliberation I decided that I wanted a Speed Six engine and after more deliberation and discussion I decided that the ‘better mannered’ Tamora might suit my needs. Buying a second hand car is at best a fraught experience. One rarely knows what lurks beneath the recently buffed paintwork or the similarly glossy description. 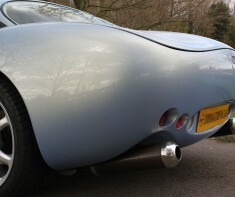 We do tend to buy with our eyes and of course this can be a tricky business- especially with a TVR. The best advice I could give to anyone would be to get an engineer’s report before buying any car. Test drive it. Mull it over. Haggle. ….I did none of this. In November of 2017 I spotted the ‘ideal’ car for me. A low mileage 2002 Tamora in Halcyon Atlantis with a triple F engine upgrade courtesy of Racing Green. It was advertised with the quirkily named Shmoo Automotive and I called one of the partners, Ed Gibson, to discuss the car. After a very pleasant conversation Ed apologetically explained that I was third in the queue for this car. Hopes dashed I went back to searching for the ‘right’ vehicle and although Ed had taken my number, he didn’t call back. Hopes were raised a couple of days later. Ed called and told me that the person he had expected would bid on the car had not materialised. There were only two of us in the hunt. He told me that given the chap was also deliberating the car, and that I couldn’t come to see the it, he could only really secure it for me if I put down a deposit…. on a car I had never seen! Now this was a risk. It was not really logical and somewhat against the advice I would give to anyone else. So of course, I put a rather large deposit on the car. A few days later saw me travel down to pick up a car I had never seen, much less driven. In the interim Ed had sent me a wealth of information on the car, including a few videos showing the vehicle going through its MOT and being prepared for sale, nevertheless I had a twinge of trepidation as I stood waiting for Ed at the local rail station where he had kindly offered to pick me up. I had no need to be concerned. The car was ‘almost’ exactly as Ed had described. I say almost exactly because in my opinion he had been a little too critical in terms of his description. I didn’t even test drive the car before I transferred the cash to Ed and then set off back home returning the car to Lancashire, only about 20 miles from where it was originally built. Before I set off, Ed was careful to point out that he has just found a fault he had not previously disclosed. The near side electric wing mirror was not working. Ed pointed this out to me and undertook to pay for its repair if this was needed (given that it may just be a loose connection). Since buying the car I have been I regular contact with Ed- his after sales service is outstanding. After the car had its winter rest I found out that it had an inoperative clutch. This turned out to require a new master and slave cylinder. A slave cylinder had previously been fitted by Racing Green in the October, they they kindly agreed to pay for the new part, but the master cylinder was not their issue. Ed Gibson paid half of the cost without my asking him to do so. 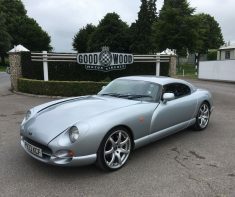 The work was carried out at X-Works, the TVR specialists near my home in Lancashire and they commented on the condition of the car saying that the chassis was one of the best they had ever seen. After carrying out a complete check on the car they could find nothing requiring any work. The car really was exactly as described by Ed. Furthermore, my friend, Richard Sails, national chair of the TVR car club commented that he thought that the price I had paid for the car represented ‘very good value’. So, would I recommend buying a car without ever having seen it, much less driving it? No, of course I wouldn’t. Never in a million years. Never, unless Ed was selling it. In that case I would be confident that the car being described was the true to the description. I’ve no doubt that the next time I’m in the market for a car Ed’s number will be the first I will call. Buying an expensive car without driving it, let alone even seeing it, is clearly daft. Only a fool would engage in such a perilous way of parting with his money. Or, in this case, a fool dealing with Ed at Shmoo Automotive Ltd, who I have found to be not only an utterly decent chap but also a pleasure to deal with. He has been meticulous, patient, communicative and completely transparent during what turned into quite a long haul of negotiating between various parties, Ed gives car dealers a good name, and I wish that there were more like him. Ed, thank you so much. …Oh, and what a NOISE this car makes!!!!!! Hazy days days in a Caterham…. 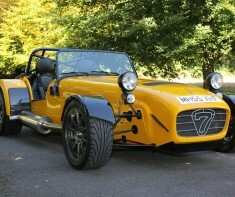 “Having wanted a Caterham 7 for 25 years, the opportunity finally presented itself – all I had to do was find the right car. I had the budget for a decent if not top spec 7 and spent some time scouring websites looking for one. As I expected to have to travel to get the right car, my searches were country wide and so when a car came up at a local dealer – Shmoo Automotive Ltd – I was a little sceptical that the perfect car could be on the door step! The hi-res pictures on the Shmoo website made the car look good, but only after talking to Ed Gibson on the phone did it become clear that I needed to see the car. The visit was like no other used car experience I have had. Ed was easy to talk to, knowledgeable, attentive and was happy to spend as much time with me as I needed. The presentation of the car was fantastic as was the attention to detail. The test drive was also a pleasure. It seemed like we could go anywhere and we had a really good run. Alas, it was over all too soon. As this was the first Caterham I had looked at, I wanted to look at a few more to make sure I had a balanced view. However, on the drive home my wife and I decided that for the budget we had and given the research I had done, there wasn’t going to be a better car anywhere. – A simple call and the car was mine. Over the next few days, Ed arranged an MOT and cam belt change just to be on the safe side. Ed also made the business side of things was easy and went out of his way to arrange a collection time that suited me. L7VVC has certainly been all over than place this year – some lovely weather and some terrible. The muddiest was the Goodwood Festival of Speed in June where we camped (and had to drive around) in a bog. We had a spin around Donnington circuit too but mainly just bumbled around the countryside enjoying the wind and noise. I’ve attached a few pictures of life with the car so far – its been a great year thank you. T350C & Biscuits – Doesn’t get better! Most people might say that a young man in his early 20’s aspiring to own a TVR would be nothing more than a pipe dream to be fulfilled in the later years in life; and until recently I would have wholeheartedly agreed with them. At the end of last year a fellow petrol head and colleague invited me to the Neil Garner open day with full chauffeur service in a Chimaera 500 on offer; naturally I agreed without hesitation. Pulling up at the workshop was an experience I’ll never forget, a sea of stunning, perfectly loud, quintessentially British sports cars lined bumper to bumper fresh from a countryside run. Part way through the day I realised a TVR was the only type of car that’s been able to tick the all important boxes: curiously interesting, incredible to look at, exceptionally rare, enough power to pull the roof off a rice pudding factory and they’ve all been designed and manufactured in the motherland. I had to have one. To the Internet! I spent the next couple of months ogling over the car I’d fallen for at the gathering, the TVR T350. It was around this time that I stumbled across Shmoo Automotive’s website. A very well presented page with lots of detail about their cars; service histories, upgrades and a wealth of photographs and videos. I was almost immediately drawn to a 2003 brilliant silver 350c. After reading and rereading all of the information on the site I picked up the phone and spoke to Ed. He informed me that this one was down at the other branch in Devon and that my details would be passed on to Ross. Ross duly made contact. After feeling really well informed and being told that there was a Red bull blue car also for sale I arranged a date to head down and see what was what. Pulling up to the picturesque country home I knew I had a selection challenge on my hands. I’d almost completely dismissed the blue car at this point but seeing the pair parked next to each other really put them at a head to head. Shortly after arrival I had the pleasure of meeting our host. I can honestly say Ross was the sort of salesman everyone hopes to deal with when going to view a car; welcoming, down to earth, knowledgable and happy to talk in depth about the cars. The couple of to be honest ‘obscure’ questions I threw his way were answered on a phone call the following day. After going out for a test drive through the country side we were invited for a cuppa and some lovely reindeer biscuits made by Ross’s wife Stella and their two boys this was followed by a mooch through the two cars paper work. A few days later and after relatively little deliberation I had decided to take the plunge and go for the silver car I’d originally gotten excited about, subject to viewing on a ramp which Ross was more than happy to arrange. I was pleased to report that this didn’t show up any gremlins and the chassis was in surprisingly good condition for being such an early example. We arranged for a couple of bits to be sorted and a date for me to collect the car. Between the ramp inspection and collection fell the Christmas holidays. Despite this any questions that popped into my head were quickly responded to, often by phone. When the joyous day finally came for me to pick up my belated present to myself the weather was far from ideal, lots and lots of rain. At least all the salt had been washed from the road right? After arriving, dotting the I’s and crossing the T’s the keys were mine. The first drive by myself was nothing short of exhilarating, even if I did only hit 50mph going down the dual carriageway! However pulling up at the fuel station the TVR showcased its first magic trick; leaving the ignition running despite the fact the key was in my pocket outside the car. Being new to the TVR scene this did for all of 5 minutes begin to worry me. However Ross had the issue identified and sorted before I even had a chance to get flustered. Within a couple of hours and one new alternator later I was on my way home. I still class the event as a triumph because I was given another cuppa and the chance to sample some more delicious homemade biscuits. (I really must have one of these biscuits – Ed). Three months later I’m trouble free and haven’t regretted even for a second my decision to buy the car; a large part of that fact I’m sure is down to the excellent service provided by Ross and Shmoo Automotive. From the first call to now, it’s been flawless and I’d highly recommend them to anyone in the market for any car… not just a TVR. You won’t be disappointed! An Elise in Finland is as rare as a moose in Leicestershire! 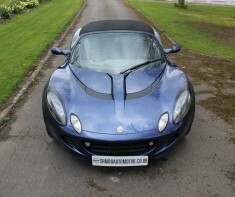 When planning the purchase of a Lotus Elise I went through a great deal of different options available in Britain. Of these alternatives one stood out. Not only for its good overall condition but also the evident expertise and experience of the firm selling the car that was reflected e.g. in the testimonials at the website. The high resolution pictures available on the Shmoo Automotive website made it easy to see many details of the car. This was especially important for me as I live in Finland and the planning stage took place here as well. On the basis of the information and photos presented on the site it was easy to book a test drive. My phone call was answered by Ed Gibson who was very flexible in arranging a meeting that fit my and my wife’s rather tight itinerary. Ed turned out to be a really nice and knowledgeable person. Must say that we have never experienced such a pleasant time when buying a car. We learned a lot about Elises in general as well as this particular car. It was a real pleasure doing business with Ed. At the end he even replaced the battery in order to make certain that one does not end up in trouble on the way back through the Netherlands, Germany and finally the ferry to Finland. The car ended up behaving very well and is now turning heads in the streets of Helsinki. Patience rewarded with stunning Tuscan…. “Having owned a lovely TVR Chimaera 450 for some 3 years, I found myself suddenly hankering for a change . I have always loved the curves of the Tuscan MK1 and spent many nights reading all I could about the pros and cons of Tuscan ownership. Having set myself a budget I set about looking for the right car in the classifieds. Although there were plenty on offer, nothing really caught my eye other than a lovely mango orange Tuscan being offered by another well known TVR dealer. Unfortunately too much dithering on my part meant the car was snapped up before I made the decision to go and view. A year went by and I started to look again, this time however I was looking for a TVR T350 . Shmoo place down in Devon had such a car and enquiries were made. Unfortunately once again timing wasn’t on my side and by the time I could arrange a trip to Devon the car had been sold. I mentioned to Ross at the Devon location that should he know of another car coming in to please let me know. A few days passed and Ross contacted me to say “I don’t suppose you would be interested in a Mk 1 Tuscan by any chance”? Ed Gibson at the Leicester office had a 2004 Tuscan Mk 1 coming in which was said to be in immaculate condition… if Interested – Ed would contact me. Appetite duly whetted…. I wasted no time and was on the phone to Ed pronto. Within a very short space of time Ed had emailed a series of high resolution pictures which showed the car to look every bit as good as described. We discussed my part exchanging the Chimaera and a fair deal was struck, subject of course to my liking the Tuscan and Ed approving the Chimaera. Two days later I arrived to meet Ed at the Leicester office and was immediately impressed by both the presentation of the Tuscan and Ed’s genuine enthusiasm for the vehicle. There was no great over the top sales pitch from Ed, just great honest friendly advice and all the time needed to look around the car and take it for a spin. Well a short drive later and following a nice cup of coffee, biscuits and plenty of banter the deal was done. I’ve now had the car 6 months and still have that eager anticipation for every drive, the Tuscan is a fabulous car and receives plenty of attention just as Ed said it would. The search to replace my recently sold TVR Chimaera with a Tuscan began at the beginning of 2016. However being based in Edinburgh, the relative rarity of these cars meant that local pickings were slim. I spent a little time viewing a few (tatty) examples within a 100 mile radius, and then decided to broaden my search. This led me to Shmoo Automotive Ltd, and a lovely looking Crystal Topaz example down in Leicester. With it being over 300 miles away, viewing wasn’t going to be easy. In talking to Ed on the phone, he volunteered some high resolution pictures of each area of the car I wanted like to see. On top of this, he happily sent on many high-definition videos of both the car and its history for me to look through and spend a bit of time interrogating. This coupled with the reputation I had read about online throughout various car enthusiast forums, and a two year engine warranty from Powers Performance led me to put down a deposit on the car sight unseen. Ed was very open an honest with every aspect of the car, his passion for the motor car really shows through. He suggested some paint work to a few areas (In addition to what was already being undertaken by Shmoo) to bring it up to showroom standard, and again kept me up to date with day-to-day pictures, videos, and phone calls. Once the car was prepped and ready for pick up, I flew down to Birmingham airport and met Ed in person for the first time! (He isn’t the guy from Wheeler Dealers). The paintwork, was STUNNING and I still can’t get over just how beautiful the car is and how good the finish was. Everything I’d expected and hoped for, all in one beautiful car. After a bit of a blether with Ed and the guys from TVR Power, I began my drive home – which I enjoyed immensely! I dropped off the motorway into the Scottish Borders when the sun was beginning to set, whipped the back window out, and enjoyed the last leg of the journey through some fantastic roads, the Speed Six popping and cracking away on overrun, giving a brilliant soundtrack bouncing off the hills. What a trip! A great experience from day one really, I wouldn’t hesitate recommending Ed and Shmoo Automotive Ltd to anyone looking for something special, and a special experience in buying it. Tuscan Tony is a happy man. 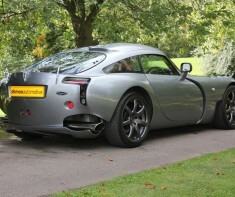 “Having been a long time admirer of TVR’s I decided to take the plunge. I carried out my research, spoke to several dealers and delved into the web, and after a few disappointments came across a Tuscan Mk 1 at Shmoo. I spoke to Ed, who was a wealth of information to back up the very comprehensive details on the website and immediately thought that this was someone I could deal with . 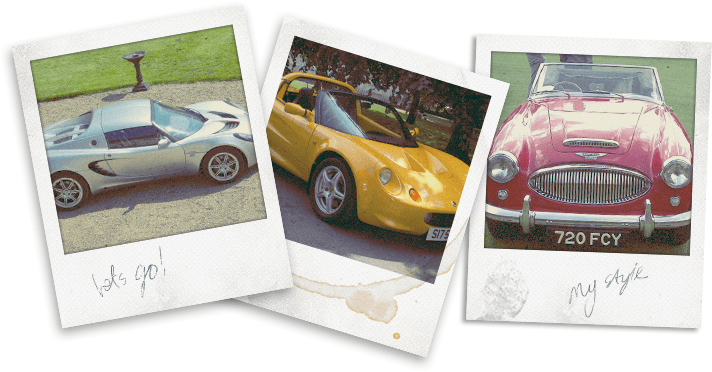 I am/was a relative novice to the TVR marque and Ed had a never ending supply of patience. Always pointing out the positives as well as the potential negatives of ownership. The Tuscan he had was in superb condition, having been well looked after by its previous owners, however the way it had been prepared for sale by Ed and his team, took it to an even higher level of desirability in my eyes. The preparation of both the inside, exterior and underside (Which was photographed on a ramp and in great detail) was superb and it was obvious the passion Ed has for his vehicles, had led him to spend hours bringing the car up to condition that defied its 15 year age. The high level of service didn’t end with me and the Tuscan leaving Ed’s premises, but the aftersales attention has been at the same high level, possibly the best I have experienced in a good number of years dealing in the fickle world of selling and purchasing vehicles ! I have just collected my pristine CSR From Ed at Shmoo and I am absolutely thrilled. I previously owned an Exige S that was prepped and supplied by Ed so I was extremely comfortable dealing with Shmoo again due to the excellent level of care and integrity that Ed clearly prides himself on. Having also owned a CSR before, I was keen to find one that was equal or better in condition to the one I regretted selling and was hugely impressed with the condition of this particular car. Ed was professional, friendly, patient, knowledgable and helpful throughout my enquiries and never pushed unduly or oversold any aspects of the car that could not be evidenced. As mentioned above, and in some of the other testimonials on this page, It’s Ed’s passion, honesty and integrity that sets Shmoo apart from the sad majority of so called specialists that I have dealt with in the past…. Having had two rock-solid experiences with Shmoo, Ed will be the first person I call when considering my next sale or purchase. Can’t recommend highly enough! I’d been looking for a nice 300SL for some time and was pointed to the Shmoo Automotive site. And I was really impressed with the high caliber of the photos and the genuine sounding and detailed description of the SL. 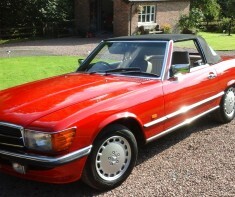 First contact with Ed on the phone was really helpful and reassuring with regards to the condition of the car, and an immediate visit was not disappointing, with the SL looking as good as in the photos and the description being spot on, which made me realise just how honest Ed had been. A deal was done and Ed was really flexible on how the payment was made with electronic transfer as the ideal option….. I am absolutely delighted with the car and it makes a great addition to my collection… By far the the best experiance I have had with a car dealer…very professional and helpful in every way…..Thanks Ed. Doing our bit for Euro relations…..
TVR is a rare breed, even more in Belgium. So I decided to have a look across the Channel and called Shmoo Automotive Ltd. I ended up in the end dealing with Ross at their North Devon location. Car addict and highly knowledgeable, Ross is THE guy to talk to. After a call or 2, we set up an appointment and off I went (on Sunday!). Following a warm welcome, Ross took me through the good AND bad of the Tuscan. He answered to every single question, regardless of the impact that it could have on the sale. His honesty was much appreciated and helpful (upcoming work to be done, maintenance/running costs). I also would like to highlight the fact that Ross and Ed do not only sell cars! They will provide you with many tips and contacts to make your new TVR ownership as smooth/enjoyable as possible. Well done Ross (And Stella). When I was a kid, one of my dreams was to go to Blackpool and come back home with a TVR. That dream became true thanks to Shmoo Automotive: I could go to the UK, bought and brought a splendid Cerbera back home in Belgium, driving a splendid roadtrip without any mechanical nor electric issue. A true happiness for me and a unique experience. That unique moment wouldn’t have been possible without the help of Ross and his wife Stella. Not to forget Phil, who inspected the car inside & out, to ensure that the beauty would arrive safely in Belgium. So a big thanks to the three of you for this fabulous moment that has been the purchase of the car of my dreams. Thanks for the servicing, your honesty, your availability, your professionalism, your proactivity… and your more than warm welcome when I came over to get the car. Ce rêve, j’ai pu le réaliser grâce à Smooautomotive : j’ai pu acheter et ramener une splendide Cerbera depuis l’Angleterre jusque chez moi en Belgique, par la route, et sans le moindre souci électrique ou mécanique. Un pur bonheur et une expérience unique. Cette expérience unique n’aurait pas été possible sans l’aidede Ross et de son épouse Stella. A ne pas oublier non plus Phil, qui a inspecté la voiture sous toutes ses coutures afin d’être certain que la Belle arriverait bien à bon port en Belgique. En un mot comme en cent, Merci à tous les trois pour cette merveilleuse expérience qu’a été l’achat de la voiture de mes rêves. Merci pour le service, l’honnêteté, la disponibilité, le professionnalisme, la proactivité,… et l’accueil plus que chaleureux quand je suis venu chercher la voiture. 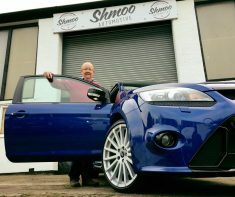 From when I first spoke to Ed Gibson at Shmoo Automotive about my new RS Focus, I was very impressed. He was most knowledgeable about his cars and was able to email lots of supporting documents like service receipts and Mot’s which were very welcome and reassuring when buying from across the water. A couple of minor blemishes on car were actually ‘exaggerated’.. The high resolution pics and video on the website were just great! They really made this car both stand out.. and gave huge comfort that I could see the car in such high quality images and detail. Ed was kind enough to pick me up from an early flight at East Midlands Airport so I was able to inspect the car in a very un-rushed way – and when it was time to complete the paper work it was done in a very efficient manner which allowed me to be back in Northern Ireland that same night by 9.00 pm. All in all an excellent experience and would have no hesitation in recommending this excellent company to do business with. 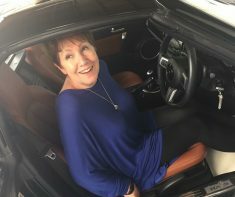 When I decided to purchase a Mazda MX5 (it was to be a secret present for my wife) I had no hesitation in giving the task to Ed who I’ve known for years and have watched his specialist business blossom and grow. What makes him different from an off-the-shelf carman is his legendary attention to detail and the certainty he would deliver on time (the clock was ticking for our French road trip), within budget matched to the car spec given to him at the outset. In addition to his own wealth of experience, his network of very professional contacts enables him to search a wide geographical area, greatly increasing his pool of options in order to make the best purchase for his clients. We were not disappointed. My wife was blown away by the car when she saw it. Ed even did the presentation with an impressive piece of theatre involving a pub lunch and a casual mention of popping in to see some of the cars he currently had in stock before we departed. This ensured until the very last second that she had no idea the car was meant for her. The video clip of the event is a classic. So, thanks Ed, nice doing business with you – again! 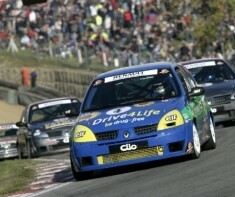 Ex Race Car, plus at least 12 other cars and bikes….and counting! I bought a ex race car for track days many years ago from Ed. I liked his honest description and great HD photos on the web site. I quickly realised that he was a petrolhead like me, an enthusiast who wasn’t just trying to flog whatever he had in stock to me. When I came to see the car it was exactly as described. Since that first car I have bought sold and SOR’d 12 vehicles with Ed over 9 years. When you have the petrolhead bug it really is good to find a dealer who is genuinely an enthusiast himself and understands that you want to know what’s not perfect with the car if anything, we all prefer to be told honestly and don’t expect a 30 year old classic to be perfect, so why do so many dealers give you the flannel. So many times I have been to look at cars and gone away cursing the lying SOB who got me to waste my time….. Not Shmoo. 12 times around the Earth in a Range Rover! After complaining to a friend that I had not found the time to find a replacement for my everyday car. My buddy basically said; “that’s no excuse…. Call Ed at Shmoo Automotive, tell him what you want and he will do the rest”. I called Ed. I told him what I wanted and what my budget was, which took all of five minutes, Ed told me he would be in touch. If I’m honest my expectations at this point were low… I did not know Ed, I had never heard of Shmoo and I was asking for a lot of car for my money. Within days Ed was back with a high spec, low mileage, Supercharged V8 Range Rover with a full service history. Exactly the car I was looking for. The deal was done over the phone and Ed personally delivered it within the week. It was immaculately presented and spotlessly clean and better than I had imagined my budget would stretch to. I bought my buddy a beer for the recommendation and then put over 300,000 trouble free miles on that beast of a car. (Ed kindly calculated my fuel bill to £91,000 during this period!). 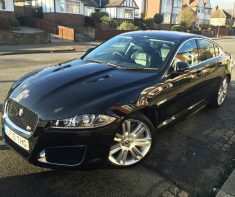 Recently, I called Ed again and once again gave him my “wish list” and budget and now I’m driving a beautiful Supercharged 5.0 V8 Jaguar XF-R that makes me smile every time I start it. I also owe Ed a beer… and have recommended Shmoo Automotive to everyone who has shown the least bit of interest in the Jaguar. The wonders of technology and the detail on the Shmoo Automotive website have allowed us to buy our 5th TVR…even sitting at my desk in Australia!! 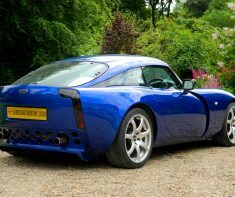 It has been a real pleasure to deal with Ed Gibson during our recent purchase of a lovely TVR Sagaris. His honesty and willingness to help us in anyway he could, certainly went a long way to securing our business. The car itself was exactly as represented on the company website and we would certainly look to do future business with Mr Gibson and Shmoo Automotive Ltd.
12mths in.. and still gloriously happy! buyers only wanting a drive of a “fancy car” or endless low-ball offers – and sellers advertising “full service history” as one stamp in five years, or mentioning minor bodywork damage which turns out be a nasty experience with a lamp post. Being new to the world of TVRs, I was doing my research on whom to buy from and what to look out for, and I heard nothing but praise for Shmoo. It’s always a good sign when you see Ed happily posting and getting involved on car forums and social media – shows there’s nothing to hide. I had my eye on a particular T350C for sale at Shmoo, and when I picked up the phone I had the pleasure of dealing with Ross. The way in which Shmoo conducts business is nothing short of fantastic. Ross was brilliant in discussing what I wanted over the phone, and was a pleasure to deal with in person. I was afforded all the time (and tea) to look over the car that I wanted, and after a bit of a chat about cars, we agreed to crunch some numbers and work things out. I didn’t even see a need to haggle as Ross and Ed both made their side of the deal very transparent. prospective buyers! – but was enough to make my petrolhead heart very satisfied. I was a bit fussy with what I wanted doing to the car, but Ross was more than happy to accommodate my needs. I even ordered a sports exhaust for the car (why not? ), which they were happy to get fitted for me while the car was undergoing a 12k service. found myself with pleasant updates as to how my car was doing, or where in the world Ed was messaging me from. Even after a year of rumbling around, I asked Ross a question about some paperwork I’d misplaced – within a few hours, it was in my inbox. I’ll be recommending Shmoo to anybody who wants an interesting car. I believe Shmoo are now also working with Powers Performance, so can often do fabulously lengthy warranties for peace of mind on the engines. Thanks for everything chaps. Congratulations on 10 years, here’s to many more. After dealing with Ed from Shmoo Automotive for the best part of ten years in both the sale & purchase of classic & modern cars & motorbikes it’s always apparent that his attention to detail is paramount. The preparation of his vehicles is meticulous & the descriptions are extremely accurate. One thing is clear & that is theres a genuine love of what he does. The whole experience when purchasing a vehicle from Ed is pleasurable coupled with a feeling of buyer confidence, knowing that the vehicle is as described & most importantly one of quality. He doesn’t stack them high and sell them cheap, he does what he does because he likes the process and dealing with like minded people. Do you think he knows Mrs Robinson? I just wanted to put pen to paper to thank you for working so hard in preparing the car, after huge amounts of partially planned and unplanned work (all my extras I know! ), finally delivering the Spider Duetto to me earlier this summer. Despite the rather dismal weather we have been able to enjoy enough sunny days shaking it down and showing it off in readiness for that all important first service after which the revs will no doubt climb! Your knowledge, honesty and general advice were extremely reassuring and your work liaising with Dave at Interservices and Shane at the bodyshop together with all the other ‘bit’ players was beyond the call of duty. Dave prepared the engine perfectly and it sounds very sweet indeed, and with Shane’s superb paint finish the car certainly brings a broad smile to everyone it passes! 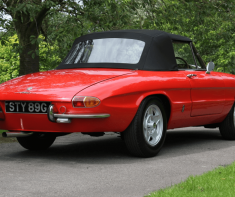 Not knowing a huge amount about classic cars myself I was slightly worried about my search as you hear so many horror stories, but I will certainly not hesitate to recommend you to any of my friends thinking of buying a classic or sports car. I will keep you posted once I have had the first oil change and minor tweaks and hope to find at least one more, shall we say, warm weekend when I can take her out and go beyond the much feted 3000 revs! Well, it looks like the time has finally come to lock the Austin Healey away in the garage for the winter and start to make plans for some fun days out in what will hopefully be a long warm summer. The long winter nights have also given me a bit of extra time and I wanted to take this opportunity to thank you once again. Obviously, buying a classic car is no small investment and it is important to feel comfortable with your supplier. 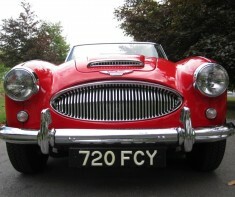 I have to say that throughout the process of purchasing the Austin Healey you were incredibly helpful and accommodating; even to the point where you opened up your premises late one bank holiday Sunday evening and allowed me to view and test drive the car. The car was thoroughly checked over and was impeccably clean when I collected it. You are clearly a classic car enthusiast and it would seem that cars are a large part of your life and not just a business. I would have no hesitation in recommending you and Shmoo Automotive to any prospective buyer. Back after 5yrs for another one…. Your life is ”easy” when you’ve found your dream car among Ed’s car collection! We bought 2 vehicles from Ed. 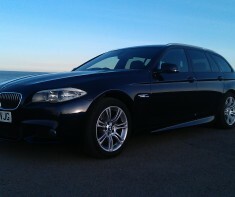 First time, 5yrs ago a beautiful Audi A8 (V8) and recently a BMW 520d M Sport Touring. So we’ve got great experience with ’’Shmoo Automotive’’ and I can say honestly… this dealer is really outstanding! Our experience: from the very first email we sent – to the day of car collection – all was fantastic! Things where absolutely smooth, easy and perfect, No hassle, No delay, No unexpected things at all. We are delighted with the exceptional customer service and we are happy to recommend Shmoo Automotive and Ed’s services to everybody. Both car was fully polished, valeted, serviced and checked. Ed even showed me all noticeable minor stone chips on the bodywork and made sure we were happy. All the important things about services and so on. I have been informed and advised how to drive the car to get the best from it and a great attention to detail. So, after all: We’ve collected both cars in an immaculate showroom condition – just like a new car from showroom. We used the A8 for many many happy miles without any problem until an accident made the car a Total-Loss, so we of course knew we would ask Ed to look for our next car. The BMW just started her life with us, but the first 5 weeks experience is lovely. The car is silky smooth to drive and perfect and we got another real gem of a car.